If you’re drowning in gravy and pecan pies, and looking for motivation, Biggest Loser’s Ali Vincent has a life jacket for you. 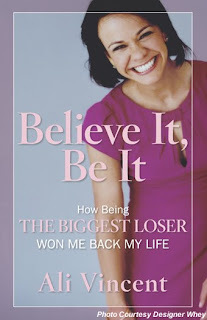 “Believe It, Be It” is her new memoir about being 234 pounds, turning her life around and losing 112 pounds. Vincent’s voice is honest and clear, and the book is easily digestible. “My story is about weight loss, sure, but it’s also about coming back to life, emerging from a place of darkness and isolation. And I know there are others who share the very same struggles, who want so much more for themselves, and who have so much more to give to others than they can currently offer.” And knowing Ali is a real person, who lost real weight, gives weight to her words. She’s not some teeny tiny trainer who has never eaten peanut butter straight from the jar, or polished off an entire bag of chips. She made a change, so it’s more believable when she says we can do it too. If the holidays are a struggle for you, pick up Ali’s book. Read it in a night or two and you’ll look at your next meal a little differently. Did you survive Thanksgiving? What motivates you? This entry was posted by kate, on Monday, November 30, 2009. You can leave your response .